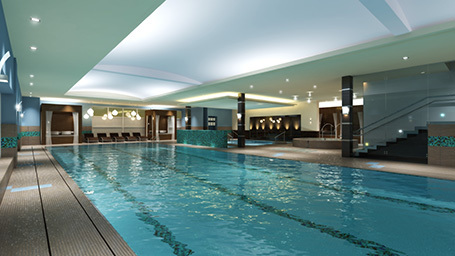 In January 2014, the World Class Zhukovka celebrated the grand opening of their new wellness center designed to create a resort-like getaway for its members. The club offers a full range of fitness and wellness programs, group and personal training, beauty spa, fashion boutique, solarium, and a fitness center featuring a premium line of equipment simulators. Spa therapists, fitness instructors, nutritionists, and the latest diagnostic equipment make each workout as effective as possible. Counsilman-Hunsaker, in association with the architectural firm Essenza, combined innovative technologies and state-of-the-art equipment in the new wet wellness center. A distinctive feature of World Class Zhukovka is the 25-meter swimming pool with high purity water, and a relaxation zone with mother of pearl Russian and Turkish baths, underwater geysers for foot massage, an authentic Finnish sauna with a cold water bath, and a Roman tepidarium.